Wireless technologies continue to evolve to address the insatiable demand for faster response times, larger bandwidth, and reliable transmission. Yet as the industry moves toward the development of post 3G systems, engineers have consumed all the affordable physical layer technologies discovered to date. This has necessitated more intelligent and optimized utilization of available wireless resources. 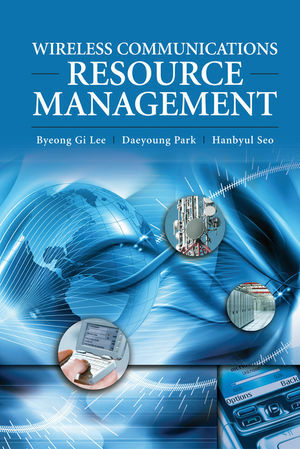 Wireless Communications Resource Managem ent, Lee, Park, and Seo cover all aspects of this critical topic, from the preliminary concepts and mathematical tools to detailed descriptions of all the resource management techniques. Readers will be able to more effectively leverage limited spectrum and maximize device battery power, as well as address channel loss, shadowing, and multipath fading phenomena. Wireless Communications Resource Managementis geared for engineers in the wireless industry and graduate students specializing in wireless communications. Professionals in wireless service and device manufacturing industries will find the book to be a clear, up-to-date overview of the topic. Readers will benefit from a basic, undergraduate-level understanding of networks and communications. Byeong Gi Lee received the B.S. and M.E. degrees from Seoul National University, Seoul, Korea, andKyungpook National University, Daegu,Korea, both in electronics engineering, and the Ph.D. degree in electrical engineering from the University of California, Los Angeles. He was with the Electronics Engineering Department of ROKNaval Academy as an Instructor and Naval Officer in active service from 1974 to 1979, and worked for Granger Associates, Santa Clara, CA, as a Senior Engineer responsible for applications of digital signal processing to digital transmission from 1982 to 1984, and for AT&T Bell Laboratories, North Andover, MA, as a Member of Technical Staff responsible for optical transmission system development along with the related standards works from 1984 to 1986. He joined the faculty of Seoul National University in 1986 and served as the Director of the Institute of New Media and Communications in 2000 and the Vice Chancellor for Research Affairs from 2000 to 2002. Dr Lee was the founding chair of the Joint Conference of Communications and Information (JCCI), the chair of the SteeringCommittee of the Asia Pacific Conference onCommunications (APCC), and the chair of the founding committee of the Accreditation Board for Engineering Education of Korea (ABEEK). He served as the TPC Chair of IEEE International Conference on Communications (ICC) 2005 and the President of Korea Society of Engineering Education (KSEE). Hewas the editor of the IEEE Global Communications Newsletter, an associate editor of the IEEE Transactions on Circuits and Systems for Video Technology, and the founding Associate Editor-in-Chief and the Second Editor-in-Chief of the Journal of Communications and Networks (JCN). He served for the IEEE Communications Society (ComSoc) as the Director of Asia Pacific Region, as the Director of Membership Programs Development, as the Director of Magazines, as a Member-at-Large to the Board of Governors, and as the Vice President for Membership Development. He served a member of the Presidential Advisory Committee of Policy Planning, the Presidential Advisory Council on Science and Technology, and the Policy Committee of the Ministry of Justice of the Korean Government. He served a Vice President of the ABEEK, the President ofKorea Information and Communication Society (KICS), and the first President of the Citizens’ Coalition for Scientific Society (CCSS), a nongovernment organization for the advancement of science and technology inKorea. He currently serves as a Commissioner of the Korea Communications Commission (KCC) and the Vice President for Member Relations of the IEEE ComSoc. Dr Lee is a co-author of Broadband Telecommunication Technology, first and second editions, (Artech House: Norwood, MA, 1993 and 1996), Scrambling Techniques for Digital Transmission (Springer Verlag: New York, 1994), Scrambling Techniques for CDMA Communications (Kluwer: Norwell, MA, 2001), Integrated Broadband Networks (Artech House: Norwood, MA, April 2002), and Broadband Wireless Access and Local Networks: Mobile WiMAX and WiBro (Artech House: Norwood, MA, 2008). He holds thirteen US patents with four more patents pending. His current fields of interest include broadband networks, wireless networks, communication systems, and signal processing. He received the 1984 Myril B. Reed Best Paper Award from the Midwest Symposium on Circuits and Systems, Exceptional Contribution Awards from AT&T Bell Laboratories, a Distinguished Achievement Award from KICS, the 2001 National Academy of Science (of Korea) Award and the 2005 Kyung-am Academic Award. He is a Member of the National Academy of Engineering of Korea, a Member of Sigma Xi, and a Fellow of the IEEE. Daeyoung Park received the B.S. and M.E. degrees in electrical engineering and the Ph.D. degree in electrical engineering and computer science, all from Seoul National University, Seoul, Korea, in 1998, 2000, and 2004, respectively. He was with Samsung Electronics as a Senior Engineer from 2004 to 2007, contributing to the development of next-generation wireless systems based on the MIMO–OFDM technology. From 2007 to 2008, he was with the University of Southern California, Los Angeles, CA, as a Postdoctoral Researcher. In March 2008, he joined the faculty of the School of Information andCommunication Engineering, Inha University,Korea. He received a silver award from Samsung Technical Paper Contest 2005. His research interests include communication systems, wireless networks, multiuser information theory, and resource allocation. Hanbyul Seo received the B.S. degree in electrical engineering, and the M.E. and Ph.D. degrees in electrical engineering and computer science, from Seoul National University, Seoul, Korea, in 2001, 2003, and 2008, respectively. He is currently with LG Electronics and his research interests include wireless resource management, wireless MAC protocol, and wireless sensor networks. Wireless Communications Resource Management visit the companion website to access the lecture notes for this book.